Adam Butler (@pachoopsab) of Pachoops will again be joining us all year, providing us with his weekly take on our favorite conference as we begin the March to Vegas. Earlier this week, our very own Andrew Murawa wrote thoughtfully and critically of college basketball. BLASPHEMY. But he’s not wrong. He was sure to cite his love of the sport no matter its flaws and I’d like to note a few of the tempo-related items concerning our Pac-12. Historically it’s been a frenetic pace. During a Thursday morning Twitter conversation, I was brought to this 1988 Arizona Wildcats highlight. In it you’ll notice the Wildcats crashing the offensive glass (possessions!) and sprinting out on the break off a turnover (more possessions!). Arizona would win that game, 78-70, a point total far lower than their season average this year. In 1988, Arizona scored 84.8 point per game, 15th-best in the nation. That would be a top-five scoring total in each of the last 14 seasons. Of course Total Points isn’t a statistic we love to note. It bypasses many important factors and qualifiers in understanding how the game is played. Unfortunately, tempo isn’t readily available for that historical context. A Google search, however, can easily deliver a handful of articles that articulate the slowing of the game. What I really want to do, though, is look at the history of this conference. One that saw UCLA and Cal split their 1995 series by a cumulative score of 197-188. That’s two games. By comparison, Cal’s 2012 sweep of UCLA looked like this: 132-158. This is anecdotal and perhaps not indicative of the quality of those respective games; however, there’s been a shift to how the game has been played, particularly in our conference. The century mark is a jaw-dropping feat. It used to get me tacos in McKale. When I first noticed the trend, we were in Pullman. We hated Bennett-ball and how this little family from Wisconsin infiltrated the high flying Conference of Champions with their pack-line and 58 possessions. This crap was gimmicky and understandably so. It was perhaps the logic of it that most offended us. If the coast’s elite were going to run around gyms in Los Angeles, Seattle, and Tucson, then why would you try to run with them? Since 1980, the Pac has produced the second most NBA Draft picks (217) of any conference despite having fewer teams than the leading ACC. UCLA and Arizona account for 46 percent of those picks (although we’ve already discussed their significance to this conference and more on that later). So the family Bennett set out to counter the high-flying attack of the Wildcats (and at the time the Huskies). Tony was 3-3 in his six games against Arizona. Prior to sweeping the Wildcats in 2007, the Cougars hadn’t prevailed over them in something like eons. But suddenly – and with the success of Ben Howland’s new scheme in Westwood – a change was occurring. Sure it was happening across the country too, but it was now being proven to succeed on this coast. And now it’s stuck. Because Howland successfully slowed the game down long enough for him to make three Final Fours. The little program that could – Washington State – was ranked in the top-10 at a pace of glacial (60.7, 59.5, and 58.7 possessions per game). They also averaged 66.9, 66.4, and 59.2 points per contest while finishing top-five in total points allowed per game during the Tony years. 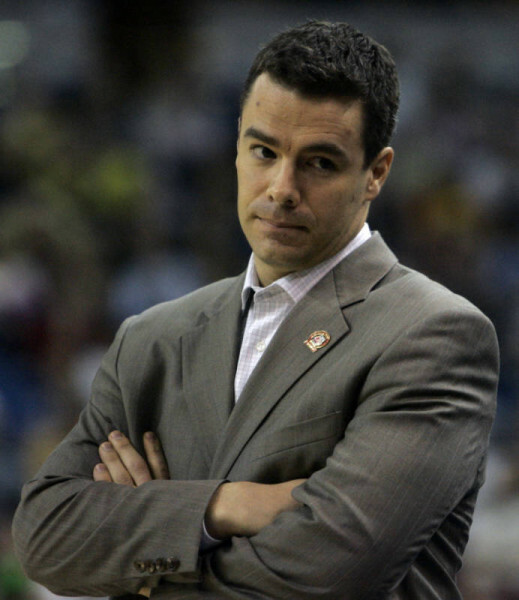 He’s now doing the same with the Wahoos and forcing traditionally fast-paced foes – Duke and North Carolina – to adjust. He’s beating them. Of course Arizona then hired Sean Miller and he’s brought the same defensive principles and authority to the conference. As we noted just one year ago, the Pac-12 is reliant upon UCLA and Arizona to be its torchbearers. Sports are a copycat industry. Winning blueprints are reproduced. Or at least that’s what teams try to do. It’s why I wonder how long it will take until a college team begins to emulate the Houston Rockets – threes, layups, and free throws. That model needs particular skill sets and James Harden is a generational-type talent. But the concept can be creatively emulated. Nevertheless, our game has slowed in part because it’s been proven to succeed. Logic, as hard as we might try to defy it, often prevails. It’s easier to get players to buy into playing hard on the defensive end while limiting the total number of scoring opportunities, than it is to improve individual – if not collective – scoring. One pertains to effort (controllable); the other to finite skills (limited). Revisiting the idea of our torchbearers, it’s why I find Steve Alford’s tenure so fascinating. His first two UCLA teams have played at historically (for Alford) fast tempos. For the most part he’s inherited his rosters, but as we move closer to what we can truly consider “his program,” I’ll be keen on watching at what pace he chooses to coach. Would it not be fascinating to have a high-octane UCLA and a lockdown Arizona? That’s essentially what we had last year and it could potentially set the conference into a whirlwind of varying styles and philosophies. I’d love it and perhaps we’re already there. If we look at last weekend’s match-up of the Oregons and the Washingtons, we are treated to a glimpse of this variety. The Ducks rank second in the conference in tempo while Oregon State ranks last. As a result, last weekend, Washington and Washington State scored a cumulative 193 points when hosting Oregon and just 103 points when hosting Oregon State. If variety is the spice of life, then maybe our beloved Pac is already a curry dish. Of course none of this arguably matters if the Conference of Champions is getting just three teams into the Dance. It doesn’t matter if you’re scoring 105 or 55 points – if you’re not winning, no one cares. In a conference with so many new coaches (four with fewer than two years’ experience at their current school), there is ample opportunity to distinguish – however they see fit – a winning style. I just hope it’s entertaining. This entry was posted on Friday, January 23rd, 2015 at 1:31 pm by Adam Butler	and is filed under microsites, pac 12. Tagged: arizona, ben howland, feature, steve alford, tempo, tony bennett, ucla. You can follow any responses to this entry through the RSS 2.0 feed. You can leave a response, or trackback from your own site.